Fairs & Festival, Fun-Fests, Family Events, Schools & Libraries, wherever professional entertainment is needed. A fun show that the whole family will enjoy! 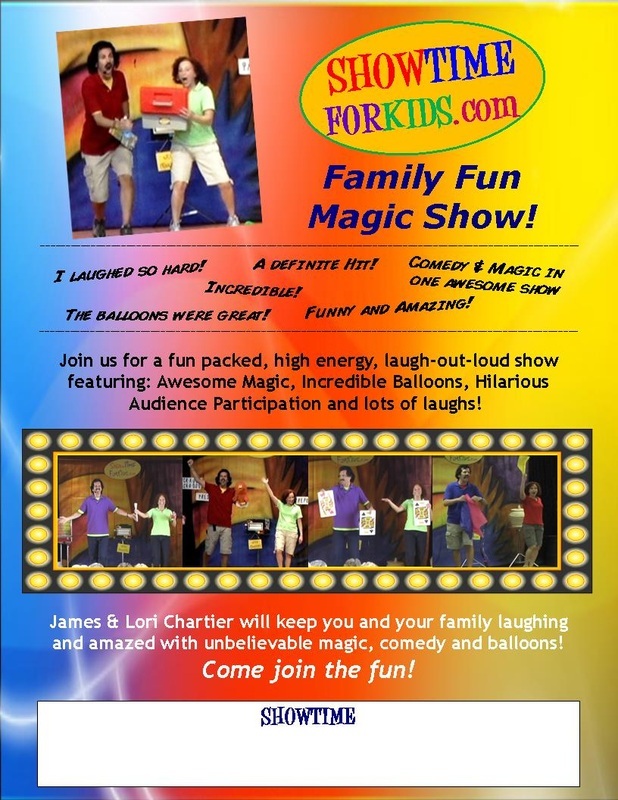 Music, Magic, Comedy, Balloons, Audience Participation and much more! This show features amazing magic performed right before your very eyes. Comedy segments that will have you rolling in the isles. Audience participation plays a big roll in the show with both Kids & Adults. Can be performed on a stage, platform or floor. All we need is an electrical outlet & an audience! Looking for a bigger stage show with illusions...we have that too! kid tested / family approved! You will see unbelievable magic happening right before your very eyes. Tastefully themed audience participation is widely used throughout the show with both kids and adults, all intertwined with hilarious comedy. auditoriums and everything in between! just right for your next event!